As parents, we always want sleep coaching to go as well as possible, right from the start. That’s why we tailor our sleep training methods to fit our babies’ ages; why we carefully select sleep training methods that fit our parenting styles and our babies’ temperaments; why we don’t sleep train during big transitions (like moving) or illnesses; and why we prepare for sleep coaching before we start. One of the ways to ensure that sleep coaching goes as smoothly as possible is to do it during a window of time in which it may be easier. 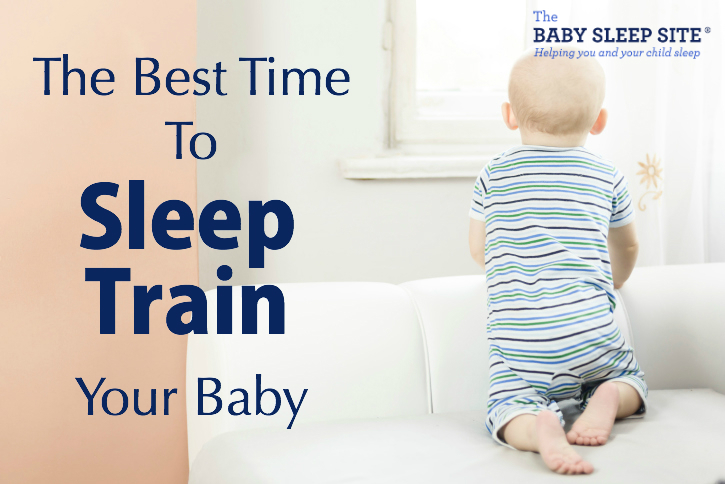 That’s right — there are times during your baby’s growth and development when she is better prepared for sleep training (and, conversely, times when sleep training may be bit harder). What are these ‘ideal sleep coaching windows’? We’re glad you asked! This is the best time to start for many families (although not all). Why? Because at this point, your baby is past the 4 month sleep regression, so she’s starting to develop more “adult” sleep patterns. Your baby is also much less mobile at this stage than she’ll be in a few more months, and that lack of mobility makes sleep training a bit easier. Finally, because your baby is still quite young at this point, any sleep associations she may have formed won’t have had time to turn into strong habits. That means they’ll be easier to change. For babies younger than this, our e-book, Essential Keys To Your Newborn’s Sleep outlines newborn-friendly sleep coaching strategies for your newborn, including sample sleep-inducing routines. We also offer special newborn-focused Personalized Sleep Plans™ that are crafted to guide your baby to better sleep in a gentle, safe way. This isn’t as ideal a time to sleep coach as the 4-7 month window, but if you skip that one, this is the next one to try. Why? Because your baby is past the sleep regression that happens at 8/9/10 months, and her sleep patterns should be back to normal. (Although if your baby has never been a great sleeper, her “normal” sleep patterns may be fairly chaotic! 🙂 Remember, it’s best to sleep coach when things are as normal as possible, so waiting until a sleep regression has passed can be a good idea. In general, it’s best to avoid sleep training during a sleep regression. And, if possible, try to sleep coach before your little one is 18 months old; after 18 months, your toddler’s growing sense of independence and willfullness might make sleep training tougher. Need sleep coaching help? Look no further! Selecting the best sleep training window is all well and good – but you may still need help in the actual sleep training process. Well, look no further – we happen to specialize in that! 😉 We have a team of caring, compassionate expert consultants standing by, waiting to create a Personalized Sleep Plan™ for your family. We’ve shared our sleep training tips – now share yours! Questions about sleep training? Ask in the comments section below. Join our Members Area, packed with exclusive content and resources. As a member, you’ll enjoy e-Books, assessments, detailed case studies, expert advice, peer support, and more. It actually costs less to join than buying products separately! As a member, you’ll also enjoy a weekly chat with an expert sleep consultant. And the best part – members receive 20% off all sleep consultation services! QUICK TIP: What’s The Best Day Of The Week To Start Sleep Training? I have a 6 almost 7 month old that we’ve started to sleep train. Naps seem to be our biggest struggle. I nurse and for a long time she would nurse and then be rocked for an hour plus because that was the only way I could get her to stay asleep. Now I’m trying to get her to fall asleep on her own and we’re struggling. My question is when nursing how do you prevent them from falling asleep while nursing? I’m trying to follow one of the sample schedules but what if I put her down at 9 and she doesn’t sleep? She can’t last for longer than 3 hours usually in between naps. @ Caitlyn – This is so normal! Naps are tough for lots of parents. As for how to keep your daughter from falling asleep while nursing: could you try moving the feeds a bit earlier, so that the end of the feed isn’t coming quite so close to the start of the nap? Some parents have success w/ moving the feeding and then doing something else before the start of the nap (like a mini nap routine). Hope this helps, Caitlyn; best of luck to you! I have a wonderful 14 week old boy. We are having a bit of a sleep conundrum. He will only sleep on me for most naps & at night. It’s getting to the point were he is so heavy that it’s physically hurting me to have him on me for so long. Plus at night he rubs his face back and forth and wiggles most of the night. I haven’t had much sleep in awhile. And I don’t think he is getting quality sleep either. I do rest while he is napping but it’s very hard for me to sleep during the day. I’ve tried to put him in his co- sleeper, next to me, baby wear and in a swing. He either wakes up immediately or cries until I put him on my chest & nurse. Is there anything else I can do? No CIO and husband works long hours….thank you so much. @ Amber — absolutely! There are many, many approaches before you get to full-on CIO 🙂 For help with naps, I’d suggest starting with our free nap guide (https://www.babysleepsite.com/free-baby-nap-guide/). For the nighttime sleep, I’d suggest downloading a copy of 5 Ways To Help Your Child Sleep Through The Night, our free sleep coaching guide (https://www.babysleepsite.com/baby-sleep-through-night-free-ebook/). Thanks for commenting, Amber! Hope these resources prove helpful to you. @ Jackie — if you’re a few weeks in, and you haven’t seen any noticeable progress, it may be time to consider a new method. You mentioned that patting and hushing usually works — you may want to try sticking with that technique, instead of CIO. That’s actually a gentler method, too, which may make it easier for both of you to do! I’ve been letting my 6 month old cry it out for a few weeks now. Some nights she cries for a few minutes, other nights it past 10 minutes of heavy crying. Every night is different and you never know what to expect. She wakes 2 times to nurse and it’s the same thing when she goes back to bed. Some nights she’ll go back to bed or fuss!! And when she fusses, she fusses!! She’ll usually fall back asleep with some patting and hushing. I don’t know if the CIO method is working for her because she has both good and bad nights. It’s not consistent. Any recommendations???? @ marisa o — This sounds really, really tough 🙁 I imagine that sharing a room with her makes it hard, too, since she’s able to see and hear you, and that means she’s less likely to soothe herself to sleep. Have you ever considered trying a sleep consultation? They’re great for babies and toddlers who seem especially resistant to their parents sleep coaching efforts. You can find out more about the consultation packages here: https://www.babysleepsite.com/baby-toddler-sleep-consulting-services/ At the point you’re at, this is probably your best option for getting help with your daughter’s sleep. Again — I’m so sorry you’re going through this, marisa! Truly, it sounds like you’re a great mom, and that you’re trying your hardest to figure out what’s best for your daughter. I know it can be discouraging when friends and family members are critical of your parenting choices, but hang in there — remember, your family members aren’t the ones who have to sleep with a screaming toddler each night! Nothing you are doing is wrong, or bad, and you’re not a bad mom for trying to help your daughter learn to sleep on her own. Best of luck to you, marisa! Do let us know how you progress with your little girl. And don’t hesitate to reach out for help, or with more questions, either by leaving a comment or by e-mailing contact (at) babysleepsite (dot) com. My daughter is 15 1/2 months old and she was preemie 6 weeks. She must have a bottle to even start to fall asleep unless in the car, but she wont take a cup.i have to hold her with her strugglign to finally try and pass out, i wait for her to fall asleep and then try and transfer her most of the times she wakes when i transfer her and starts to cry again. I am single parent alone and it makes life very hard. She will cry and if i dont reach her soon enough she will vomit 1-2 times, i’ll clean her change her the bed the floor and have to go back out the living room on the couch for her to calm back down and go to sleep and sometimes give her some more milk. She will awake again between 12-4 and i let her cry again sometimes she falls back asleep and sometimes she cries and cries (WE COshare a room) and i’ll get her and she will come into bed with me and finally falls back to sleep.. but i dont rest well and i dont think she does either..
her naps are the same way.. unless i am traveling and she will doze off with ease. please help i am not working, i feel like i’ve done everything even the checks at different times. i am struggling because sometimes i’ll have to rush to the bathroom or hold it and if she wakes again she goes into a fit. Im sure some part of it is separation anxiety and i never did a sleep training with her in the beginning but she didnt need it she was a good sleeper but always fell asleep in my arms first and then i transferred her and it started around 7months and my father and stepmother dont’ listen or agree to my arrangements for her and told me to wait till she was much older but i need it done now. i was told after a trauma like that violent crying is why she slept so well. i did it for 2-3 weeks but the naps were always an issue and she always cried for 35-110 minutes allt he time. 🙂 I also forgot to mention that I have to rock her to sleep every time before putting her down for her naps & bed time – where as before I fed her & rocked her in a chair for 5 minutes until she was sleepy, but awake, & then put her down to sleep – no problem. Now when I rock her in my arms (heavy & not so little anymore) I have to wait until shes fast asleep, so that she doesn’t wake when putting her down otherwise i have to start the whole process over again. @ Bianca — Ok, I see. Yes, it sounds like she’s becoming dependent on the rocking to fall asleep. You can utilize the same sleep training techniques and strategies now that you used when she was 5 months old. It may be best to sleep train while you’re at home, and then utilize some of the tips from the room-sharing article to keep up with good sleep habits and practices while you’re traveling on the road. This way, you won’t have to worry about disturbing other people while you’re sleep training. My one year old has been a perfect sleeper up until 2 months ago, when we started traveling. I did some sleep training in the beginning with her & she slept straight through the night (10 – 12 hours), without a feed, from around 5 months. Now, because of the unsettledness of constantly moving around & not wanting to disturb other fellow travelers, I pick her up at night when she cries and put her in bed with us… & I feed her! It seems like I have gone and undone all that hard, paid off work & created bad habits for her. We will be returning home in a month or so, only for a couple months, but do intend on traveling for an extended time there after.Is there anything I can do to get her back into a good routine again? @ Bianca — since you mentioned that you plan on doing extended traveling for awhile, you probably don’t want to retrain her on how to sleep in her own crib, in her own room (since that’s not going to be your ‘norm’). Instead, you’ll want to focus on helping her learn how to sleep on her own, and stay asleep, in a traveling environment. Let me ask — when you travel with her, does she share a room with you? If so, this post might be helpful to you: https://www.babysleepsite.com/sleep-training/sleep-training-room-sharing-tips/. It deals with how to sleep train while room-sharing. Some of those tips will likely apply to your situation. @ Desi — after 18 months, the whole concept of ‘ideal windows’ kind of disappears. There’s a sleep regression that happens around the 2 year mark, so that may be another tough time. But once you’re past 2, there aren’t really ideal ages anymore. @ marisa o — oh my goodness, I’m so sorry you’re dealing with this! Sounds awful. No wonder CIO isn’t working for you; it must be absolutely awful to see your daughter cry and then throw up! I don’t blame you a bit for giving up on this method — doesn’t sound like it’s right for you or your daughter. There are other things to try. How old is your daughter? Knowing that will help me better understand what resources to point you towards. @ Kristin Maslan — yes, Wonder Weeks is a good resource, especially for the newborn and infant stages! @ Hena — both, really. Helping a baby learn to fall asleep on his/her own is the first step in helping a baby sleep through the night. And the phrase ‘sleep through the night’ is kind of misleading; it technically means a 5-6 hour stretch without feedings, but many parents use ‘sleep through the night’ to mean a full night of sleep the way we adults would consider it (more like 8 or 9 hours). You can teach your baby to fall asleep independently at any point after 4 months, using a variety of techniques. Most babies can sleep 5-6 hours without feedings by about 6 or 7 months of age (some much earlier, some a bit later). By 12 months, babies should be able to sleep 10 or 11 hours without needing any feedings. I read your guides and tried staying in her room not looking at her and that didn’t work and then just went to CIO and leaving. My daughter has a easy gag reflex and always throws up within a few minutes of crying violently. Its has abrupted my sleep training for her and i face issues when she goes to her grandparents they dont follow my directions and tell me im traumatizing her and she is a baby and doens’t need it. Ive given up because I dont want a baby throwing up every night and with the irregularities of changing homes. Are there such windows later – after the 18-th month or after the child is two years old? When you’re talking about sleep training, are you talking about sleep training to have them sleep longer at night, or to get them to fall asleep on their own? If it’s to get them to sleep longer, what is the expectation in terms of how many continuous hours (an EBF) baby should sleep at night? I have been using the Wonder Weeks app to help me with knowing when my baby will have predictable fussy/clingy periods and more stable periods. I have found it to be very accurate,and so helpful to know exactly when to sleep train! My son is 10.5mnths old and been sleeping in our room(mostly our bed). His own room is nearly ready(finishing renos) for him to be in! Should we wait till 11mnths to start sleep training? He is bf back to sleep and uses a paci. I am in the process of weaning to just bottle during day and at bed time. Any tips greatly appreciated.